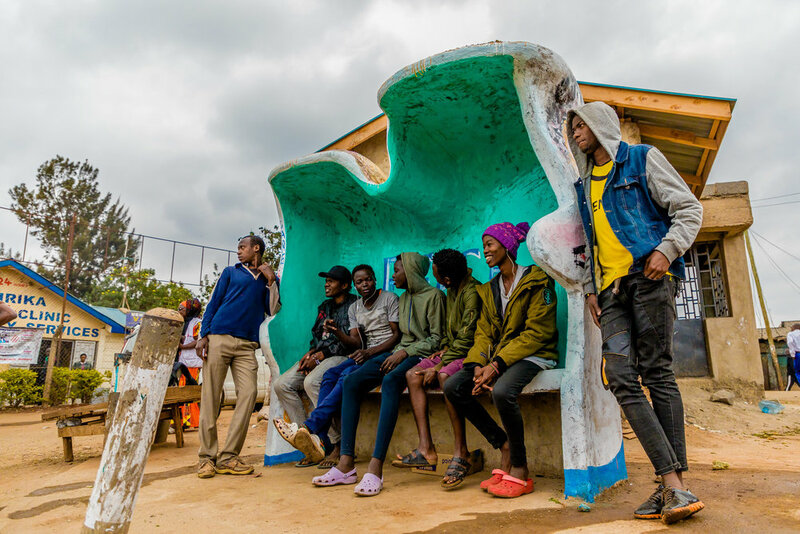 To pay tribute to the 20 years of Doctors Without Borders in Kibera and thank the community, we worked with local artists to build "Tuko Poa" benches around Kibera. The benches take the form of two human silhouettes, capturing the spirit of community strength that lives through Kibera. The Doctors Without Borders logo is painted in "invisible paint" so it only appears when it rains outside. This balance between what's seen and unseen is symbolic of our relationship with the community–though our physical presence in Kibera may be gone, the spirit of prioritizing health, treating people regardless of their backgrounds, and empowering patients continues through the lived experiences of those we’ve met along the way. Special thanks to Siama Musine, Faith Atieno, Jeroen Matthys, and artists Frank, Kevo, Joseph, Chesta, Michael for making our dream come true. Collaboration with Brandon Lee & Jennie Fou. Inspired by Iran's original Wall of Kindness. "Hey New York, Let's keep each other warm this winter. Leave any new or used blankets, scarves, and jackets for those in need. If you don't need it, leave it. If you need it, take it." Collaboration with Brianna Mercado & May Matsuo. Draped this corner with 49 balloons - one for each of the victims of the Orlando shooting - and 700+ cranes to represent the community that came together. "Today, we celebrate your lives. Let's flood this world with love."